Landau Traveling Exhibitions, Los Angeles, CA. The exhibition, THE ART OF ELIZABETH CATLETT from the Collection of Samella Lewis, is now available for scheduling through 2020. 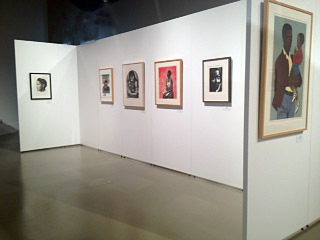 The exhibition The work comes from the collection of artist, educator and author Samella Lewis, Ph.D., Professor Emerita, Art History, Scripps College, Claremont, CA. Lewis was a student of Catlett’s in the 1940’s and Catlett became her mentor. The two became lifetime friends. Elizabeth Catlett (1915-2012), a sculptor and printmaker, is widely considered one of the most important African American artists of the 20th century. Her work blended art and social consciousness and confronted the most disturbing injustices against African Americans. She is best known for her work during the 1960s and 70s, when she created politically charged, black expressionistic sculptures and prints. Catlett was born in Washington, D.C. in 1919. She attended Howard University where she studied design, printmaking and drawing. In 1940 Catlett became the first student to receive a Master's degree in sculpture at the University of Iowa. In 1946 Catlett received a fellowship that allowed her to travel to Mexico City where she studied painting, sculpture and lithography. There, she worked with the People's Graphic Arts Workshop, a group of printmakers dedicated to using their art to promote social change. After settling in Mexico and later becoming a Mexican citizen, she taught sculpture at the National Autonomous University of Mexico in Mexico City until retiring in 1975. 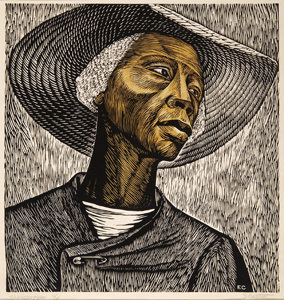 ”Elizabeth Catlett was my friend and my mentor in art. Upon my graduation from high school, it was my good fortune to receive a scholarship to study at Dillard University where Elizabeth was the art professor. When I first met Elizabeth in 1941,my attempts at making art were strictly based on visual concepts of the European models. She is the reason that I began to see and think creatively." Dillard did not offer a studio art major, however, with Elizabeth’s assistance I was able to obtain an art scholarship from Hampton Institute to study with Dr. Viktor Lowenfeld who at that time was regarded as the most important scholar in the field of art. While I was a student at Hampton, Elizabeth and Lowenfeld opened many art doors for me. With the passing of Lowenfeld, Elizabeth remained my friend. I shall always remember her as being my mentor who was responsible for my life in art. This exhibition features 30 works - sculptures and graphics by Catlett plus 5 works by her husband, artist, Francisco Mora, and 5 works by Samella Lewis. 5 works by Samella Lewis. Space Req: 2000 sq feet. 1. STEPPING OUT, circa 2000, bronze, 30 x 7x 7 1/2"
2. PENSIVE, 1946, bronze, 16 1/2 x 10 1/2 x 8 1/2"
3. 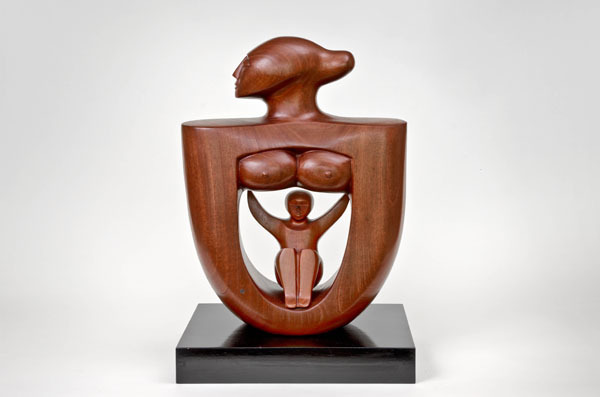 MATERNITY, 1971, wood, 20 x 15 1/2 x 6"
4. 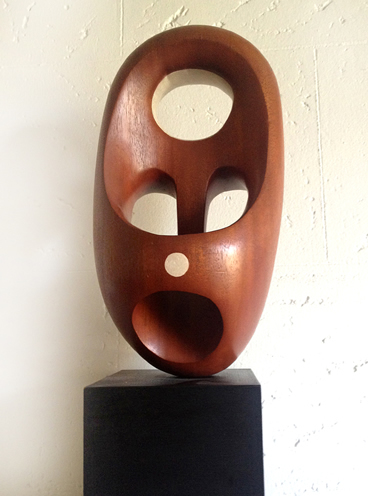 MAGIC MASK, 1971, mahogany, 11 3/8 x 6 x 5 1/2 "
5. MOTHER and CHILD, bronze, 15 1/2 x 5 3/4"
6. MADONNA, 1982, lithograph,edition 126/180, 30 x 20"
7. CIVIL RIGHTS CONGRESS, 1949, woodcut, 7 1/2 x 12"
8. DANCING, 1990, lithograph, edition 34/100, 17 1/2 x 23 1/2"
9. MALCOLM X SPEAKS FOR US, 1969, linocut, 59/50, 27 x 35"
10. SURVIVOR, 1983, woodcut, AP, 11 x 10"
11. THESE TWO GENERATIONS, 1987, lithograph, 30X 20"
12. ROOTS, 1981, mixed media, edition 12/110, 18 1/2 x 23 3/4"
13. SHARECROPPER, 1965, linocut, edition AP, 17 3/8 x 16 1/2"
edition 32/33, 21 x 27"
15. LIDICE, 1977, mixed media, edition AP, 20 x 13 3/4"
17. NEW GENERATION, 1972, lithograph, edition A/P 6, 33 x 21 1/4"
19. DOOR KEY CHILD, 1987, edition A/P, 21 x 14 3/4"
20. FOR MY PEOPLE, 1987, linocut, edition 6/40, 27 x 20"
21. GLORY, 1986, linocut, edition A/P 3, 16 3/4 x 10"
22. RED LEAVES, 1975, lithograph, 22 x 18"
23. WOMAN?, 1996, lithograph, 16 3/4 x 10"
24. ON THE SUBWAY, 1986, edition 293/300, 23 x 14 3/4 "
25. A SECOND GENERATION, lithograph 1992, edition A/P IV, 15 5/8 x 13 5/8"
26. CLARICE, 2004, lithograph, edition A/P, 23 3/4 x 15 1/2"
second edition 25/25, 15 x 22"
28. PAULINE, 1967/2003, lithograph, second edition 11/25, 22 1/2 x 15"
29. 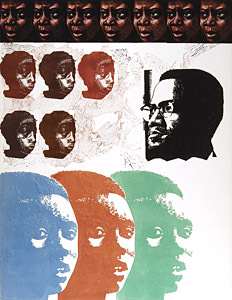 DOUBLE PROFILE, 1978, lithograph, edition 5/35, 22 x 30"
30. LIBERTAD PARA ANGELA DAVIS, circa 1971, offset, 11 1/2 x 9 1/4"
31. FEMALE FIGURE, 1986, serigraph, 40 x 24"
32. MINERS, 1959, oil on board, 35 x 22 1/2"
33. LA DEMOCRACIA, 1958, woodcut, 21 x 15 1/4"